â€œLife here is not normal, we sleep with one eye open because anything could happen anytime,â€ Nhlanhlenhle Shandu tells The Daily Vox. The mother of two is seated on a single bed with her two toddlers. One is crying for bread but there is no food in the house. Shandu grew up in Mayville, not very far from the harbour of Durban – a fact she is surprised to learn wonâ€™t be backed up by her local councillor, who claims not to know her. 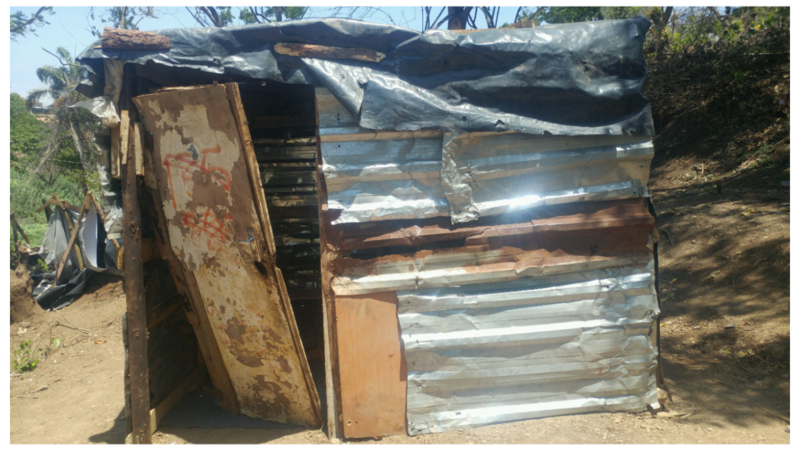 On Thursday last week, a group of armed municipality security personnel allegedly stormed into the small forest behind Mayville Secondary School, where residents of Abahlali baseMjondolo (shack dwellersâ€™ movement) Khenana branch have erected their shacks, and told men to be separated from women. 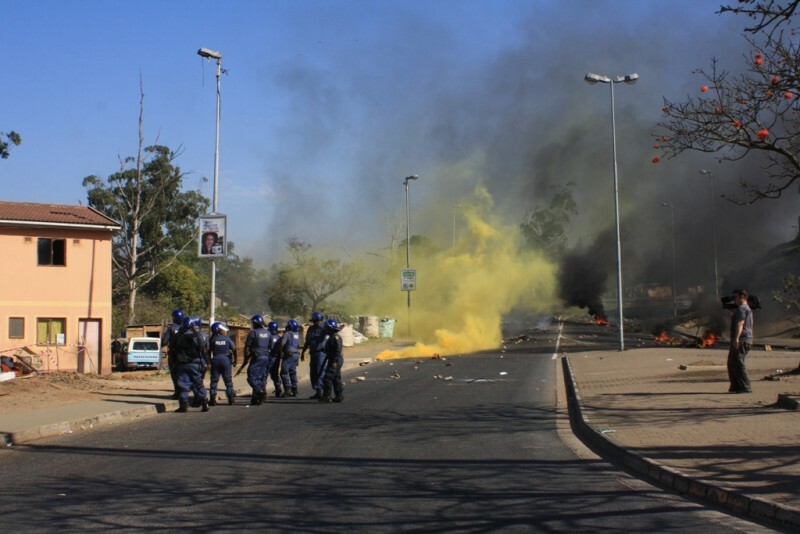 â€œThey instructed women to leave the area and told men to remain behind, we got confused,â€ says resident Simanga Mkhize. Mkhize says that this was followed by a pool of rubber bullets and everyone started running. â€œAfter realisation of what was happening, everyone started running in different directions for their own safety. Unfortunately, one man who tried to run got tripped by a tree and fell down. He was then shot twice with a live round. He was shot on the foot and in the abdomen and had to be rushed to hospital,â€ Mkhize says. Mayville is famous for informal settlements and violent evictions are commonplace – the evictions have prompted numerous protests, resulting in death of a number of people, including a 17-year-old school girl Nqobile Nzuza. Although the struggle for housing in the Mayville informal settlements has claimed lives, residents say they continue to live under repression, with the municipality and councillor demolishing their houses. Khenana is a home to families and there are children living in the settlement. Residents say that it’s not easy raising children here as everyone endures the victimisation that comes with evictions. Nhlanhlenhle Shandu says when the armed men come, there’s no exception on women and children. â€œI have to run for life with my kids because when they shoot the bullet doesn’t choose who it lands on. I always pray that it hits me instead and not them. â€œWe are poor and unemployed, we have nowhere else to go. What we don’t understand is that we found this piece of land vacant and it was a forest but now they are chasing is out. We are being treated like dogs here, nobody deserves this kind of life,â€ Shandu says. 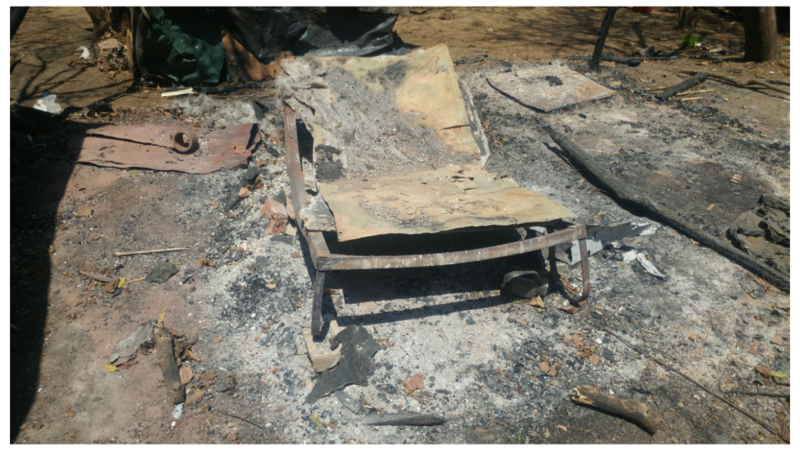 Walking into Khenana, one is greeted by ashes, remains of furniture and burnt trees. What seems to have been someone’s room now lays bare with a bed frame covered in ashes. â€œAfter chasing us out of the settlement, they burn all our belongings and even if you wish to rebuild you have to start from scratch,â€ Mkhize says. Aside from their houses being demolished and burned into ashes, dwellers say they also get shot, even after running. Landu Tshazi was instructed to leave his house but was still shot after tripping and falling while trying to run. â€œI did not resist, I followed the instruction as I was told but the security guard kept on telling me not to look at him. He told me to run and I did, he fired a rubber bullet and it hit on the jacket I was wearing because it was thick. â€œWhile I was running, he did not stop following me until I tripped and fell. He then came closer and told me he was going to blow my head. He had three guns with him. He pulled one from his pants and shot me on my foot and pointed it in my head. I pulled up my lower body trying to cover my face, that’s when the second bullet hit me on the abdomen,â€ he said. Tshazi also said doctors have told him that the damage caused by the bullet was severe. â€œThey told me to come back to run more tests. I’m worried because I haven’t been able to feel anything, this might mean the end of my manhood,â€ he said. EThekwini Municipality spokesperson Msawakhe Mayisela Mayisela has denied the allegations, saying community members had become disruptive during the demolitions. â€œThe allegations are untrue. The City did respond to a land invasion in the area, which is earmarked for a housing development. During the demolition of the illegal structures, members of the community became volatile, attempted to attack members of the Cityâ€™s Land Invasion Unit and burnt down a private vehicle parked in the area. Those making the allegations are advised to report any criminal activity to their nearest South African Police Service station,â€ he said. Residents of Khenana have vowed not to leave the settlement.